Whether you need a single pull up banner stand for your reception area or a complete wayfinding signage package for a new campus, CSDPrint has the flexibility to help. Having worked for schools, colleges and universities for many years we fully understand that being adaptable is vital. No two projects are ever the same! Our aim is to create a seamless team working alongside your marketing personnel. We appreciate how important it is to pay attention to every detail for example pricing, budgeting and planning. We’re experienced at following tendering procedures and liaising with estates teams and planning departments if required. We also know how critical the timing of installations are and will schedule our fitters for before or after the school day, or in the holidays so that there is the minimum disruption. We’ll also take great care to ensure the highest levels of health and safety are maintained at all times and be assured all our install staff are DBS checked. Leeds City College (LCC) is part of The College Group, Leeds’ leading education provider. CSDPrint has been working with LCC as they rebrand 8 separate buildings which are used by over 35,000 students and 1,200 staff. 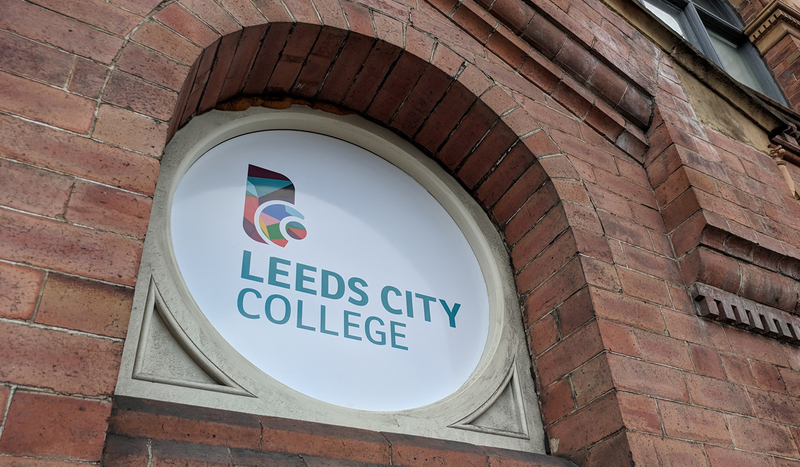 LCC awarded CSDPrint the contract to print and fit a large selection of exterior and interior signs and graphics at three of its city centre colleges. That’s not just a few exterior signs and interior wall graphics but everything from totem signs, 10m mesh PVC banners, 200sqm of window vinyls and 100sqm of wall paper to 20 wall display frames, open day exhibition stands and much much more! The biggest challenges have been adapting the designs and selecting materials and fixings to ensure that every item adhered to the exacting planning and conservation. For example the first phase of the project we tackled was the new Printworks Campus. This collection of buildings is on the 4.5 acre former Alf Cooke playing card printing works and is centred round a magnificent Grade 2 listed industrial building. Built in 1881, both the printworks’ exterior and interior are listed. Secondly we set about applying the new brand identity to the 1960s 11-storey Technology College buildings. On one of the busiest streets in the city centre, this phase brought with it very different requirements. We not only needed to schedule fittings for when the college was closed to ensure the utmost safety of the staff and students, but also to avoid busy traffic periods. The third phase was the rebranding of Park Lane College which whilst it is slightly away from the city centre and is therefore easier to access, it is much larger. Flexible production scheduling to meet particularly tight deadlines. Our client, Richard Lewis, Director of Student Recruitment & Marketing at Leeds City College, very kindly gave us this feedback.